When we were in Frankfurt a while back, we took a tour with local tour guide Verena Rose who walked us along and talked us through the amazing Kleinmarkthalle food market in the city. 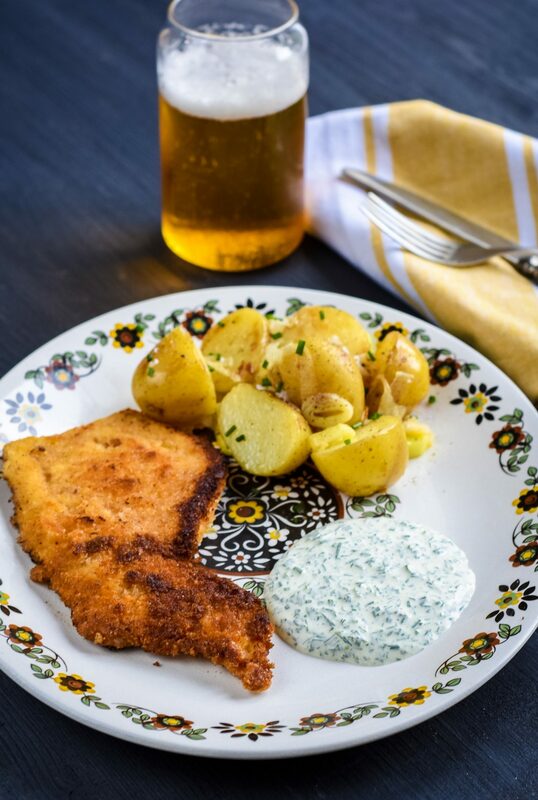 Verena talked about the most famous dish of all in Frankfurt – schnitzel with green sauce. 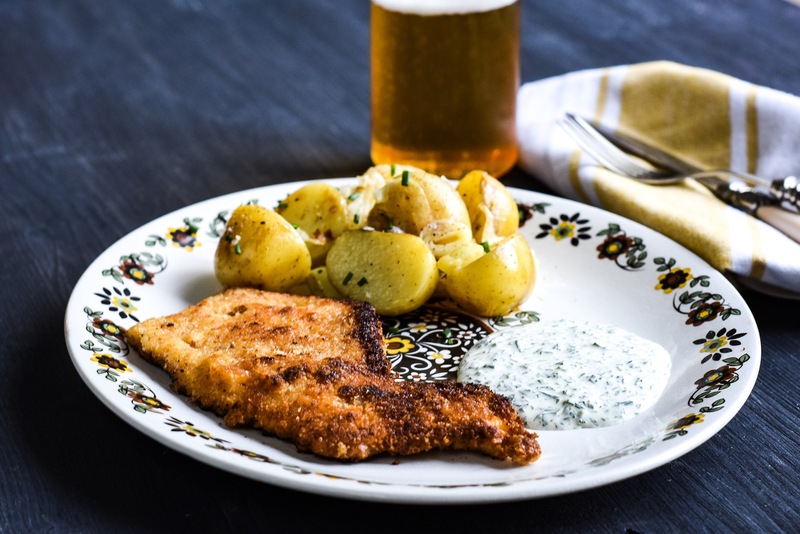 Pounded, breaded and fried meat served with a unique creamed sauce made using a specific selection of seven herbs, each one local to the Frankfurt area, all in specific amounts. So in terms of local recipes, this is as local as they come and definitely ‘de terroir’ as it can’t be replicated elsewhere. These native and local herbs are what make the sauce something truly unique and delicious. There are a couple of different twists on Grie Soß, but primarily it’s made using parsley, chervil, borage, chive, sorrel, cress and lemon balm. Lovage and Salad burnet are also often used in substitute for other herbs not available. We loved it so much we raced home to recreate it. Now, ours is just an imitation because we couldn’t get most of the herbs local to Frankfurt here in Ireland. So we’re simply using that idea as a suggestion and adapting with what we could find locally. In summer in Ireland there’s a wide variety of fresh herbs available across this green land, but the seven herbs we’ve used in the recipe are pretty much available in supermarkets year-round. 1. Make your green sauce first, as the herbs need time to soften in the sauce and give their flavour. Don’t be tempted to blitz these in a processor – they won’t have the right consistency and will turn to mush, quite possibly grey/brown mush as the processor breaks down the cell walls. Use a knife and some patience for this task: very finely chop all the herbs and add to a bowl. 2. To the herbs, add the sour cream, lemon juice and seasoning. Taste, add more seasoning if necessary and then thin out if it’s a little thick with the milk or water. Cover and leave in the fridge for 1 hour, or as long as you have. 3. Next, prepare the turkey. Using a mallet or rolling pin, or whatever heavy bashing implement you have to hand, put each breast between two sheets of cling film and flatten to an even thickness of half a centimetre (1/4 inch). Leave on a large plate, to one side. 4. Assemble two plates and a lipped baking dish. In either plate put the seasoned flour (be generous here) and the breadcrumbs mixed with the finely grated cheese. In the baking dish, whisk the eggs to break down and slacken as needed with some water. 5. Dip the turkey into the flour to coat, shake off the excess and then dip into the egg. When covered in egg, allow the excess to drip off before coating in the breadcrumbs. Note: to make things easier, use one hand for both the flour and breadcrumbs bit and the other hand only for dipping the turkey into the egg wash and then from there dropping on to the breadcrumb plate – this way you won’t end up with wallpaper paste fingers! 6. Repeat with all the turkey and leave on a plate whilst you heat 20g butter and 20ml oil in a large pan over a medium heat. 7. When the pan is hot and the oil and butter gently bubbling together, fry each schnitzel (we did two at a time in our pan) for about 2-3 minutes per side (depending on thickness and colour). You want it to be golden and lightly crisped all over. 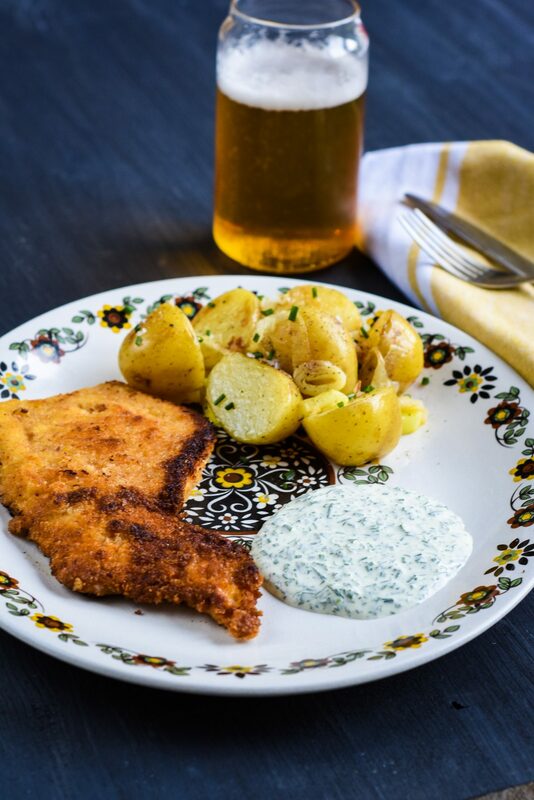 Allow to cool and firm up after frying on a plate lined with kitchen paper for a minute or two, and just before serving sprinkle each schnitzel with some coarse sea salt and a little freshly-cracked black pepper. 8. Serve immediately with some steamed new potatoes sautéed briefly with some buttery leeks and 3 tbsp of green sauce per person. For more on Frankfurt, continue reading our Guide to Coffee in Frankfurt or our 48 Hours in… Frankfurt City Guide. If you’re thinking of heading along to the Christmas Markets in Frankfurt and Wiesbaden, we have a post on that too! Previous Post Eurovision 2018: In Summary, Our Thoughts.